Celtic Or Newcastle United - What Next For Fraser Forster? | NUFC Blog. Celtic Or Newcastle United – What Next For Fraser Forster? Newcastle United Goalkeeper Fraser Forster is approaching the end of his second loan spell at Glasgow Celtic, and decision time is fast approaching over what happens next for him. The big keeper has in the past been the target for some unfair and unhelpful comments from some sections of the United support. Personally, and as a plastic Celtic fan who probably has seen more of him than most, I rate the lad highly, and would much prefer to see him back at United next season, where I think he could give Tim Krul some serious competition for the No1 spot. 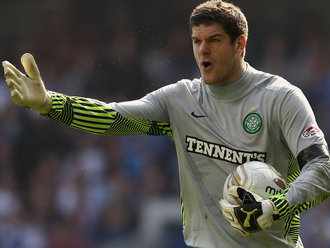 Forster has done well at Celtic, and has developed into a very good keeper. Neil Lennon, Manager of the Scottish Champions also rates him highly, and has already begun to set out his stall with a view to taking him permanently. This of course will depend on what view the United heirarchy take. It will also depend on whether any silly money is put on the table for Tim Krul’s services this summer – it has been rumoured, for example, that Tottenham Hotspur see him as an ideal replacement for the ageing Brad Friedel. I’m sure they do! But whether they have enough money to buy him is another matter! They can always have Rob Elliot of course. Apparently, Forster has ambitions to play for England, and is worried that staying in Scotland might limit his chances to break into the international scene. Neil Lennon however, thinks the opposite – that signing for Celtic permanently would actually enhance Forster’s international chances. “He is only 24, so in terms of goalkeeping that is very, very young and he has got great potential and a great career ahead of him if he keeps doing the right things. “We are hoping to speak to his agent and Fraser himself in the next few weeks. “He is making all the right noises at the minute, so it is a case of getting things sorted out. We have been gradually speaking about things over the piece. It’s worrying that Neil thinks he only has to discuss a deal with the player and his agent. It sounds as if United might already have sanctioned a move. That may be wide of the mark of course, as United have yet to respond to Lennon’s overtures. I hope this is just some early drum-banging from Celtic – as given the choice between Elliott and Forster, I know which one I would rather see in the Keeper’s jersey at St James’ Park. A £2 million future fee was agreed when the loan deal was signed at the start of the season; that’s why Celtic don’t have to negotiate with Newcastle. I’ve heard several times that they have the first option to buy for around the £2 million, £2 million odd area, and also that Forster himself wants the move too. Lennon is not being arrogant. I’m going to presume you don’t realise that part of the deal that took Forster for his SECOND loan was that Celtic had first refusal on an already agreed £2 million transfer. Good piece though-the lads came on hugely this season and played a major part on bringing home the trophy. I had heard about the mooted fee too, but I don’t think it’s contractual. Still reckon this one might have a twist in the tail if big money were to come in for Krul, which Ashley couldn’t/wouldn’t resist. Thanks for the positive feedback Neverbeten – as a plastic Celtic fan myself, I can’t really lose on this one LOL! He still reminds of Frankenstein’s monster every time I see him. Y’know when you click the blog header and it takes you back to the main page? Does anybody else find that, with the new header, you always want to position the cursor right on the end of Worky’s Nose like I do?? Obviously the guys a prospect and IMO would be foolish to lose him for only two million. Celtic got one of our goalies back in the day, who went on to surpass anything he did at NUFC, his name was Ronny Simpson, lets not repeat that. It’s a long time since Jock Stein, Chuck. Worky, he’s gotta lotta nerve comparing Forster, to Frankensteins monster. Chuck, You got one of our (Celtic) goalies , a young lad named Shay Given. We got Séamus John James “Shay” Given from Blackpuddin Rovers! Fraser Forster knows if he wants to become a top class keeper he has to play in a proffesional league – not at a sunday league team in scotland as he does at present! That’s a bit unfair Stevey Boy – in fact it’s a lot unfair….. I gather you don’t watch much scottish football? Or maybe aren’t old enough to remember who were the first british club to win the European Cup? Nobody watches much Scottish football, that’s the problem. Kilmarnock are the English equivalent of who, Croydon? Should merge the leagues (EPL and SPL), then Celtic and Rangers (if they still exist) could have some real competition and the pub teams could still play each other and not get beat 0-6 every few weekends. Well done Stevey boy, I knew it wouldn’t take long for that old chestnut to come out. When was the last major domestic honour won by Newcastle Utd? 1955 I believe, your team is hardly a national record setting bunch, are they? Any time Celtic have came across English opposition, they have accquitted themselves well, so do not spout any of your superiority complex nonsense.Your crowd are buoyed up financially by the success of the Manchester and London clubs, via Sky money,you just have to look at Ashley’s attempts to sell your club, no-one wanted you!! The very least Forster will bring back to your club will be a willingness to win, European experience, the experience and confidence of playing in front af a large partisan crowd every couple of weeks, the knowledge of what is required to win at a REAL ‘big club’ oh, and a few winners medals. He will be able to show them off in the toon dressing room, just to show your boys what playing for winners gets you!! I have a fondness for the toon, but arrogance like yours is the reason why you get a bad name. You will probably reply with some nonsense about you being the bigger club etc, please don’t, it’s boring! I will admit I know nothing about Scottish football, but that might be part of the problem – unless you are in about a 2 mile radius of the club, you just don’t care. There was nothing arrogant in my article mate? Playing in front of a big partisan crowd – 52,000 enough? I could go on – and please forgive any of my colleagues who choose to point out that if United only played one other team in our league we might have won stuff too….but you really have asked for it! I think O’Celtic should join Major League Soccer. Seriously, the teams are pretty good now and crowds average about 20,000 a game. It is only about 6 hours on one of those flying birds to New York or Boston. Really, if you win a medal, it might mean something. Yeah i ken what you mean, but in the day NUFC were heavy into Scots, Simpson, Brennan, Scoular, Mitchell. Norn Iron, Alf Mc michael, George Hannah. Not to mention plenty of local lads. How old are you Chuck? I don’t even remember them players except for Wynn. Utd 111, please re-read my post, I actually mentioned Stevey boy by name in reference to his post, never mentioned you at all mate, or your fine article. The attributes I was pointing out that big Fraser would be returning to Newcastle with were ALL positive ones, ones which would enhance HIS career and YOUR club!! In no way was this meant to be derogatory, so please read carefully before you let off both barrels. If you read GS’s posts as well as Stevey boy’s, you will see why we as a collective get a bit annoyed at the way our team is spoken about. Not every Toon fan is a geordie, or are even English, they come from all over, so what annoys me is the view that Celtic are a small, parochial outfit. We have a massive fan base from all over as well, including ,by my reckoning at least 2 on this thread. Yes, the SPL is rubbish, but that is the circumstances Celtic have to deal with, so having a go at them for doing their jobs correctly and winning in a 2 horse race is unfair and a way too simplistic statement. The ‘2 horse race’ argument is an easy way out for the less intelligent of your readers as the prospect of either Celtic or Rangers playing in any of your leagues will not happen, so the theory of ‘ if we could hold our own’ will never be tested,(and I for one do not want this to happen, we are Scottish. Instead of guys like GS and Steveyboy rubbishing MY team, they should be praising YOUR team for the great league position they are in, and thanking Celtic FC for giving young Mr Forster a chance to ply his trade in a competitive manner and not in meaningless reserve team fixtures. Do not see this as a slight on you UTD 111, my beef is with the less informed and blinkered dou!! You are the one that came on here to talk about O’Celtic. They are the last thing on my mind. As I thought I made clear, I know nothing and care nothing about Scottish football. Just read your own post @20, you will see how you contradict yourself later @27. It is all in writing here, so you can’t run away from it. Aye I know mate – you’re preaching to the converted here. In my humble opinion, Celtic are one of the biggest clubs in the world when measured in fanbase terms. And if the club had a fraction of the Sky money that props up the English clubs…they would more that compete. An English club – Berwick Rangers – is welcome in the Scottish League. Welsh clubs are welcome in the English Leagues. But the english are running scared of Celtic ever entering the EPL – because they know what a shift of power that would represent. Personally, I would love to see it. 2003 UEFA Cup should remind folks what Celtic can do when coming up against the likes of Liverpool and Blackburn for example :) And what a massive world-wide club it is. I well remember Celts were jetting in from all over – America, Australia, NZ. Nobody has ever had so many fans without tickets in one place – but they just needed to be there! Enjoy the championship celebration mate – I’m sure it will last all summer and beyond. And good luck fo the double. You have proved my point in a wonderfully erudite way. You do not even have the common decency to call the club by either it’s proper name or by a nickname used by Celtic fans, merely using inane schoolboy humour to insult. The very fact that you are following this thread shows that Celtic are on your mind, I can get you a free hat and scarf if you like!! Mind you you would have to wear big buckles on your shoes and learn to speak with an Irish accent like the rest of us wee leprechauns!! So, friends of mine gave me a budgie because their cats were terrorizing it in it’s cage. I didn’t want it but I took it to be nice. I left the door to the cage open,it flew outand my dog killed it. I will enjoy it mate, and thankyou for the good luck wishes. I will also be hoping that Newcastle manage to keep the momentum going and keep their well deserved position and (hopefully) get to play on the Euro satge next year. I bid you all goodnight and hope your season finishes as happily as ours in the Celtic family has. I didn’t mean to offend you. I was just farting around. Schoolboy humour is all I have so don’t take that away from me. UTD111: I wasn’t being a cnut, was I? That’s why I don’t go on many blogs, it is so easy to think you are having a larf and be misunderstoodz. Tell me about it!! I’ve been misunderstood so many times when trying to be humorous! The problem with the written word is – you can’t see the smirk or the body language, so the actual words become soooo much more important!! Sawdocpat, I appreciate your decency as a football fan and your honourable support of a great club, just as we support NUFC. Two clubs out of the spotlight but with genuine fans. Personally, I would like to hang on to Forster because he’s obviousuly a good goalie, but I don’t see Krul being budged from our no. 1 spot and Fraser needs to push on. I’d say it’s his choice, and if he ever displaces Joe Hart, I will be rooting for him. Chill brothers its a blog that’s all. A good blog of course (albeit run by a man with a dodgy past :lol: ) but its your view/opinion and you have a right to air it ! If people dont like it they have the opportunity to reply. There’s no football on this weekend so I have to have a go at somebody. We didn’t sign my uncle Billy either, who has a broken hoof, a dodgy eye and one testicle. maybe we did and his name was Guivarc’h. No, worky was part of the old scouting network. Calm down, calm down, there is footy on this weekend. and GS its our biggest game of the year today!! For years fans of other Scottish (and sometimes other nations,)have banged on about Celtic’s use of it’s irish roots more than it’s Scottish identity. You now have a Celtic fan proclaimimg their Scottishness, yet it is still not good enough!! Wee steps my friend, Rome wasn’t built in a day. Celtic, Rangers and all the other SPL teams ARE Scottish, instead of looking over our neighbours fence and casting a jealous eye over the EPL, we have to get on with trying to find a formula that makes the SPL even slightly attractive to the regular,honest fan.Yes,there is a lack of money,talent and flair, but it’s all we have. But to have your ‘gears grinding’about the lack of a Scottish flag, is quite sad really. The game must have been so bad that it was better to watch the crowd!! I am a regular SPL attendee, and I also go and watch a lot of junior football, which is brilliant for it’s open, honest play. If the ‘Big Boys’disappoint so much I recommend this brand of Scottish football, very satisfying indeed Derek, oh, one thing though,you don’t see many Scottish flags at these games either!!! ONLY HAVING A GIGGLE !!! your pure aggression comes through in your writing. I’m not convinced that the criticism of the SPL is justified. Having lived and worked in Scotland I was a regular at Hibernian for a couple of years. Matchday was pretty much the same as it is for any other footy fan. Pre-match natter with mates, a few beers, watch the game – ups and downs, shouting at refs barmy decisions etc etc, after match banter more beer, curry/chinese etc. The thing is – there were plenty of good games to watch – and anybody who thinks it’s only about two teams should get themselves along to a Hearts v Hibs game for example – flippin life or death that one!! We have Scottish (Glasgow) football in England because they manage just about every team. Aggression……………or passion, mate? I’m sure if a Mackem came on here castigating the toon army, you would vehemently defend yourself and your fellow fans. No difference here mate. I just can’t stand by and let it happen unchallenged. what I would say is that I have never been to The Stadium of Light but I did go to the Sunderland Empire to watch a pantomime, same difference. Until this season you didn’t rate? Geez it wasn’t that long ago when you lot benefitted from a young prospect keeper that we didn’t want anymore. Shay Given from Celtic again? I kept telling myself for the last week to not come on here because I sound like I am a moron. Then I see what Chuck writes and he sounds like Cliff from Cheers. So maybe, I am not so bad after all. Ih the old Scottish game is s@@@ shouts! And if we were there I wonder if our £25m over 5 years shirt deal with Nike would rocket? Increased revenue of £60m + per season would allow us to buy world class players . Jealous that in the last decade Scottish clubs have reached 2 European finals ? If sky ever do dictate to the premiership for us to come down there… You know that we will be a super club ! How can Sky take away the cash cow Paulo? It is symbiotic. Trust me mate – NUFC fans are not jealous of your club. You’re sounding like a Man U glory hunter from Essex mate. Lots of respect for Celtic – and for me personally, lifelong support – but no jealousy. It is hard to explain to outsiders. When you live in Newcastle and go to games, it just gets in your blood. You don’t hate other teams, you just love your team. Man U can win 20 titles and I don’t care. C’mon Liverpool and Andy Carroll. we’ve always liked you, honest LOL! I was watching some Harry Enfield “Scousers” to get myself wound up for the game, like. Nicked few tyres and broke into a few houses as well. and tweeted to Joey Barton and his best mate Lucian Freud. You are right, the game was pretty awful. The game wasn’t Ireland vs UK so why have Irish flags and Union Jacks. Then, after the game, just like every other old firm game by the way, the result was down to the referee??? I’m unsure whether the Whocastle Utd (O’Celtic, LOL!!) support want big Fraser or not, we do, but I would like to give you my gratitude for your comments, on this site and more so other Whocastle Utd sites, for their comments concerning this matter. These comments make your support come across as an extension to the racist sectarian cheating tax dodgers over at Ayebrokes. Comments slagging off the big chap and his team mates of the last two seasons, ‘plastic medals’ and such, lets big Fraser know what the Whocastle Utd support are really about and I’m sure Fraser will take this into account when making any decisions. Ps. If the big man wants to play in a crap team (when was Whocastles last Euro run? ?……em….come to think of it, when was your last domestic run!! LOL!!) I’m sure Pardew will be happy to show him the way. West Ham, the worst results in SEVENTY YEARS! League One Southampton, pumped out on his jacksy pronto! And I’ll do you and your club a favour by leaving Chris Hughton out of it. calm down-calm down Liverpool’ll win allright. Glad to see an actual celtic fan showing themselves. This is the type of drivel that I have to hear every day at home. I don’t believe a Celtic fan would come out with that rubbish. Must be nice to have a default place in europe every year, you should be proud. How did the cup final against Kilmarnock go ? Also, do you remember the headline “Super-Caley-Go-Ballistic-Celtic-Are-Atrocious” ? From when Caley were in division 1, great league. If you don’t believe that was a celtic fan your have never met 70% of old firm supporter’s. Just look at Neil Lennon for goodness sake. Nothing wrong with Neil Lennon mate – stands up well to the death threats don’t you think? Look folks – this article was about Fraser Forster’s future – it wasn’t an invitation for the worst elements of each of our great fanbases to try to outdo each other at making schoolboy remarks about each other. Can we put biases and misconceptions or even bigotry to one side in here please? Never hard that one before. Perhaps there is a reason? He is a total scum-bag. He hasn’t been getting death threats from referees. Everton leading 1-0, liverpool gifted it though. Two Champions League (that’s a big Cup big teams play for in E.U.R.O.P.E BTW) last 16 places in the last 5 years and a UEFA cup final in the last 9. Not bad for a “default place” eh? If big Fraser wants to play on the big stage, I’m sure he will make the right choice! how did you get on in the champions league this season MaxX ? Or the Europa League for that matter ? How did you get on against Arsenal ? Deafult place. Could have done better, but nothing to be embarrassed about and ultimately unlucky not to go through. What was Whocastles last Euro results…….if your memory goes back far enough! Would probably have been more recent if there was only 2 teams in the league. You forgot Celtic 0 – 2 Arsenal. The most recent result btw. EUROTOON HEH HEH SWEET !! MaxX-I don’t think many on here are remotely interested in scottish football it is fooking dull. Tyneside celebrated today as Andy Carroll fired his home town club Newcastle United into (at least) the Europa League next season. Big Andy rose majestically to score a header, the second goal for Liverpool, which saw them beat Everton 2-1. United are back in Europe where we belong, even if we finish sixth! Of course United also have a great chance of Champions League football next season, being currently joint fourth with Tottenham and two points ahead of Chelsea. It isn’t mathematically certain yet, after all. I know….but I reckon it’s “nailed on” as the trendy commentators say these days…..
Why is everybody talking about how big or small Newcastle or Celtic are? We should be talking about Forster. Unless some kind of miracle happens, he won’t replace Krul or Joe Hart – better for him to stay at Celtic where he’ll play football regularly. £2 mill can be spent on an upcoming hot prospect.. I reckon United’s position on Forster could be changed if there are signs we might lose Krul in the summer. Prior to the Sky tv money generated by the EPL, the two Glasgow giants, with big state of the art stadiums, worldwide support, tons of gear sales, were competitive players on the european stage. The collapse of the Setanta deal, has however relegated them to playing in a league, no better than that of say the Scandanavian leagues. Would they fare better by joining the English leagues and advancing to possibly the EPL ? It’s unfortunate for instance, that the home Internationals were discontinued, mainly i hear because of the annual Scottish invasion to Wembey and the fan misbehavior that came with it. Not only that, the recent behavior of Ranger fans in Manchester, in a european game, was disgusting and why they behave as they do is a question they should give serious thought too. So even if they are willing to join the lowest tier (by that i mean Div.2#) and work their way up, it would be a better alternative to slowly deteriorating in a league starved of funds with little hope of any improvement in the near future. With what appears to be a lot of objection from English fans to any alignment or switching of clubs, it seems unlikely any time soon. Though there are precedents in place, with Welsh sides, playing in England and English sides playing in Scotland. Plus i heard little objection a few years back to Wimbledon ‘s possible move to Dublin, which of course never came about. So whats the answer to the survival of these two sides as major clubs ? Perhaps it may be in an alignment with other european sides in an Atlantic league, with teams from various leagues aligning to-gether in order to generate a large population base which in turn could generate a decent TV package. It’ simply the future of these two giants, is seriously threatened, by a lack of funds. Comments on Whether we should sell Forster for two million or not, should be IMO be based on our evaluation of the guy. Someone on here mentioned he had been watched by Spurs, recently ? Is he btter than our two reserve goalies ? Or should we just let him gain experience while being paid by another club, until we are either ready to bring him back or sell him. So i sound like Cliff from Cheers do I ? Look i’m not going to trade insults, but why dont you address the general football thread, instead of making this a forum to insult people. Chuck – personally I think Forster is worth more than £2M. I don’t think the rumoured “agreed fee” is contractual. Mike Ashley wouldn’t let himself be tied to that at the beginning of the loan period in case Forster had the sort of season he’s just had! Just my opinion – but Totts interest in Krul is another factor here – especially if they “do a Liverpool” and empty their little piggy bank to make a daft offer. Definition of Irony : Boy gets sold to RBD’s, struggles for a season to justify his tranfer fee, then scores winning goal in semi final to give old club a leg up into Europe ? What are the chances of meeting the RBD’s in the Europa League final next season ? Absolutely nothing, Chuck. They’re Scottish teams, so they belong in the Scottish League. As we’ve already established, it wouldn’t be fair to English teams to allow them into the English league unless it was right at the very bottom pf the English League’s pyramid. They could apply to join the Northern Football Alliance (Division Two) and get the chance to compete with titans such as Bedlington Terriers Reserves, Wallsend Boys Club and Athletico North Shields if they really want English football that much. I don’t like to pry, honest I don’t…. But I think we should be told LOL! Chuck, TV money in only 3% of Celtics income, and Celtic have no financial problems whatsoever, to sugest otherwise is just uninformed speculation, or believing what you read in the ranjurs propaganda machine, AKA the Scottish mainstream media. Derek, you’re opinion on how Celtic qualify for Europe is irrelevant, I’ve given you a VERY brief summary of our results, when we’ve got there, over the past 10yrs (Icould go alot further), perhaps you might oblige in doing the same for Newcastle Utd over the same period. If you want to up the stakes we could make it the last 50yrs! As I said I’m sure Fraser knows were to be to play on the big stage. Ps. You keep refering to Celtics 2-0 defeat to Arsenal (hardly a leathering). Two questions; when was the last time Arsenal played domestically outside the EPL or the old English 1st division and what was the atendance at Celtic Park that night? I’ll give you a hint, it was just short of 60,000, a shocking attendance I agree, European nights at Celtic Park usually pull in 62,000!! This isn’t a “my club is bigger than your club” article. Although I understand why folk are introducing it in order to justify where they think Fraser should go. My understanding is that he is a Newcastle United player. So it’s only fair to point out that United will have a big say in what happens to the lad. At the end of the day, like most footballers, wherever he goes, he’ll end up a very rich man! As usual – two more horses died today trying to jump those disgusting fences at Aintree Liverpool. Why should innocent animals die in the name of “sport” – just so some folk can have an afternoon out? By all means race horses – but give them a chance to also stay alive. UTD111, Rule number 2: Mention Celtic AND Rangers in the same piece and it’s a pathway to complete and utter disaster. Damn good for business though Worky LOL! I agree, UTD111, but what about footballers? Another one, Livorno’s Piermario Morosini, has collapsed with a heart attack, and unlike Patrice Muamba, he died. What’s gannin’ on? Once again completely off topic, no one’s mentioned that Martin O’Verrated’s Blunderland only managed a 0-0 draw against downbeat and almost certain to be relegated Wolves this afternoon, after being thumped 4-0 by Everton. We’ll have to start calling him “Agent O’Neill” if he keeps it up. “AndyMac, I don’t like to pry, honest I don’t…. I was keeping quiet about Wolves cos I remembered we had them 2-0 and threw it away. “People in Glass Houses” sprung to mind! Well I can understand it now mate. More or less ignored this Celtic are bigger than anyone thread but this needs a rebuttal. But thats the point isnt it Max ? You and Rangers are guaranteed European football every season so you would think that your European coefficient rankings would have risen gradually over the past ten years ? Yet there you are just snuggling up underneath Apoel in 63rd place ? The last season we played in Europe, albeit after a run of poor managerial appointments, we were still in the top ten. Its not really an opinion, its a fact. Did you see Aberdeen vs Hibs today ? That is the standard that you are up against so obviously you qualify by default every season, congratulations. Ever heard of the saying, you are only as good as your last result ? I didn’t take history at school because i don’t really care that much about the past so save yourself the hassel and don’t bother going back 50 years, I don’t care. All I see know is our National team is down to 48th in the world below Armenia thanks to the old firm, well done. Must be difficult to fill a 62,000 seater stadium from a country of 6.5 million people that have 2 teams to choose from and you dont even come close to that week in week out. Think the average is close to 50,000 ? Just kidding. I respect your opinion and you sometimes make a lot of sense. If he’s Cliff, I’m Norm LOL! Have we qualified for Europe now if we finish no lower than 6th??? Somehow, when Liverpool are bad, they still win stuff. When we are bad, we get relegated. Yes if Chelsea don’t win the Champions League. If they did – we’d have to finish 5th. Ashley will have to give the approval to buy more Frenchies now. There’s no way we can win THREE cups AND the league with this small of a squad. At the start of the season I think 4 of 8 football writers at The Guardian tipped us to go down. but im watching FC twente v NAC breda on paddy power tv. if you want to watch two of our rumored prospects play then they you should sign up to paddy power. currently 0-0 at half time. ive heard Luuk de jong is thought to be coming to toon(according to NUFC.COM) as well as the defender mentioned lately. De jong just scored a wonder Goal. im definitely liking de jong, fast skill and power all in one. you are probably the most opinionated person on this blog, and you wonder why I call you strident? he’s that good? I thought we should have signed Ricky Van Wolfswinkel, just so I could say Ricky Van Wolfswinkel in polite company. dropped two massive clangers, conceded two goals. i wouldnt sign him for toffee. de jong on the other hand, another Shearer anyone? GS ive just say and watched him play for 45 minutes. i would say the new Shearer but you could go as far as saying a taller Aguero. that number 19 were are after is busy hanging his head in shame. just lost his team 3 point. he fell for a simple trap. he is center back and was dragged into the far side of the box, leaving their striker unmarked. not only that but the player he was trying to catch nutmeged the ball through his legs to pass to his striker. who put the ball in the net. the second goal 90+3 minutes. the ball was crossed in, douglas ducked leaving it to the NAC striker, who put it in the back of the net. de Jongs goals were great. his first goal he got the ball just out side the center circle and just ran with it, he was closed down byt three defenders and he ran with the ball across the front of the box and popped the ball into the bottom left hand corner from just out side the area. his second goal was just as good, twente broke and played a neat passing game, de jong passed it to his mate and when de jong ran into a little bit space his mate returned the ball. one touch from just inside the box squeezes past the keeper who did everything he could. the guy look top class. apparently he is only young, luuk de jong. well i watched the game for around 45 minutes and the two mistakes from the number 19 were appalling. he literally left the pitch with his head in his hands. if you see NACs two goals you will see why. Worky this dindong guy has everything shearer had at his age. I real hope the rumours are true that we already have a deal in place. If he makes the euros his price will rocket. That defender can stay and wait for his passport as far ad I’m concerened. I’ve seen more than that, Stephen, though not a huge amount, and I agree that this De Jong gadgie certainly has something, actually, he has alot, and seems to be very good with the ball and and very good in the air too, with potential for further improvement. I’ve heard that Liverpool have been very keen on him though and he might be a bit dear, like Vertoghen the Ajax defender who Arsenal are after. As you may know by now, I like it red hot and Dutch, and I try to keep up with the Eriedivisie as much as I can. One thing I can tell you about FC Twente, who we’ve bought Tiote from already of course, is that they have very good scouting. Site user “CloggyBob” lives there though, apparently, so he’s probably seen far more of him than we have. Obviously your objection has nothing to do with football, as your constant mentioning of Scotland makes clear. What exactly is it about the Scotch, that annoys you so much? after all they are almost 99% anti-Tory, have a history of militant trade unionism,are a land of great engineers, philosiphers, poets and were it not for it’s brave army regiments on the ramparts of the former British empire, it would have collapsed long before it did. Seems everytime the Scots mention doing something that would benefit themselves, they get stick, its fine for the UK to have lived off oil and gas deposits located in were it an independent country, Scottish territory. To be rewarded by being the trial horses for a pole tax, the answer to both trade union militancy and a consistent anti Tory voting history. Give em a break for Ch**st sake ! And hey! im now taking stick for some of the comments made by you, go figure ? As for the Celtic fan who believes Celtic have no Financial problems, he just diproved his own argument by stating total income from TV is around 3% of income. Look guy, compare that with what the English second tier make from tv revenues and you are still below par. I’m afraid the days of Celtic or Rangers winning any silverware other than the Scottish cup are going to be as rare as hens teeth, so living on past glories before TV revenue, is all thats left, sorry ! Yes but you only mention income levels there mate. Whatever their income levels, if they tailor their expenditure to take account of income, they could well be in control financially. That’s a bit sexist. You will offend the female readers. Oh, maybe not, there aren’t any. You dont get it ! If Gatesheed tailor their expenditure to take account of income, they could be in control financially….. In control of what ? My statement in case you missed it, is the fact we have two former football giants, who now cant compete, one in fact bankrupt. Due to lack of funding from TV. How can you compete for players if your income is 5% of your neighboers in the EPL. Sure in the day when each clubs income was measured by bums in seats, shirts, etc., the could compete, but when your income is less than English second tier clubs, how do you compete against the big European sides. On the other hand, If Scotland decides to seperate intirely (Devolution) from the UK. Then perhaps they could become another Norway, with enormous revenues from North Sea Gas & Oil. Were that to take place (Norway being an enormously0 and Scotland become the equivelent of a Oil rich State, then perhaps things may change. Just dont hold your breath waiting for it to happen ! You are arguing with yourself. I thought you could start an argument in an empty room, but you are proving it now. If you have nothing of interest to say, other than to insult people, just f*ck off ! I didn’t realise that you were so thin skinned. You try to dish it out, but can’t take even a little bit of gentle ribbing in return? and talking about Scottish devolution is interesting? Sorry, I didn’t realise we were on Question Time. I was pointing out in my reply that income level doesn’t cause financial problems as long as expenditure is tailored accordingly. You are deliberately misconstruing my point. I stated that both the Glasgow giants, can no longer compete on the european scene, due to lack of revenue. But niether cam compete at the higher level of say the EPL or for that matter most big European leagues. There was a time when they could, but lack of revenue has relegated them to a status of say a Scandinavian league, being unable to buy the quality players needed for higher competition. Some Celtic fans on here obviously refuse to accept that rational, but to have a large fan base and a mega stadium, without generating the neccesary funds to run the club, in direct competition with other major European leagues, means what ? clubs who through lack of any real competitiom in the SPL, make the competition every year, what does that mean. Better to swallow ones pride and put in a bid for membership in English football, than to slowly go down the tube in the SPL.